There's only one thing I want you fellows to do. 1. Begin the journey & don't let anyone talk you out of it! The adventures you will encounter in social media will, truly, in many respects, be no less remarkable than the adventures encountered by that unlikely and timorous quartet that joined forces to go after their dreams in the Wizard of Oz. There are plenty of reasons not to begin the journey or to abandon the journey: fear of the known and unknown, limited resources, inexperience, unexpected obstacles, critics. However, just as in Oz where the journey offered the only real hope of achieving important goals, so, too, in today's world does social media offer the only hope of achieving many important goals, whether for an individual, business or non-profit. ...Now, more properly, one might have expected lesson number one to talk about planning. Sometimes, however, like the characters in Oz, we find ourselves swept up in a journey before we realize it's even begun, needing to learn and improvise along the way. It's how most journeys happen. Don't be discouraged by this: just know that you will need to learn and improvise along the way! 'Be social?' We're only on lesson two and we're being told to 'Be social.' That's part of the problem! What does 'being social' mean in the world of social media! She was always eager to learn about and from others she met along the way. 3. Build a team along the way. Dorothy was expert at this. She did it in a social way, by simply talking with and helping others she met along the way. She was quick to invite others to join her in her journey. The best friends you'll meet in social media are those who share in the love of learning. As you offer to help them, they will offer to help you. Social media changes at such a dizzying pace that the team you build along the way will be able to assist you in many unexpected ways. Don't go it alone. Build a team by being social. 4. Know that it's okay to be scared along the way. There's much to learn along the way in social media, much that is confusing, much that can be disheartening, scary. 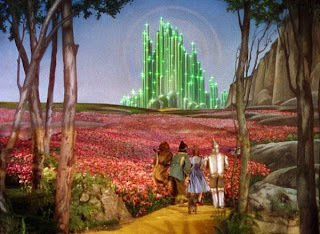 If you're accustomed to traditional PR and marketing, you'll quickly discover you're not in Kansas anymore. Things are very different. Centralized messaging doesn't work. Indeed, "messaging" itself doesn't work if it's not part of a real conversation. Work through your fears. The friends you make in social media, by chatting or tweeting with them, will help you overcome your fears and equip you better for your journey. What you do not have by way of knowledge in one area, those you have connected with along the may well have in abundance and you, likewise, for them. Ask, share, and learn. 5. Know that you will encounter unexpected obstacles and "haters" along the way. Along their way to Oz, the gradually-emboldened quartet found that they were besieged by many unexpected obstacles and "haters" - those who wanted to turn them back from achieving their goals. Know that you, too, will encounter many unexpected obstacles and a few such haters along the way, though most of the "haters" you will encounter will be without the charm of those encountered by Dorothy and her companions. Do not be discouraged by the obstacles. Work through them. As to the "haters" - don't give them much of your time or energy. Move past them as quickly as you can. And, whenever needed, turn to your social media companions for support. 6. Be yourself, know what makes you special, and celebrate it. What endeared Dorothy to nearly everyone she met, was her simple, determined way, her honesty....Oh, yes...AND her ruby slippers. Now Dorothy was a plain country girl, yet, she had a pair of ruby slippers that were the talk of the town wherever she went. They helped make her who she was. Dorothy was smart enough to figure this out and not to take them off or give them away. What the heck am I talking about? Figure out what makes you special and be who you are. If you're true to yourself in social media and show a bit of who you really are, you will find success. Why? Because most people genuinely like others, however quirky they may be, when they show and share themselves. If you give away what makes you special, you're unlikely to meet success in the journey of social media. 7. Continue on your journey, whatever the bumps, and you're likely to achieve your goals. Wizard of Oz: Frightened? Child, you're talking to a man who's laughed in the face of death, sneered at doom, and chuckled at catastrophe....I was petrified. I like being social and engaging with people and all the followers are not quality, only some of them are and those are the ones i interact with. Just wanted to say something regarding the "haters" - a word which I'm coming to dislike. Transparency is key - and courtesy and politeness is key too. In the auto industry - of COURSE the people who had trouble with their cars are going to come out vocally anywhere you are - they find a piblic forum in which to vent and also hope that maybe Honda will DO something about their problems. Thanks, Great! Interestingly written review. For industry automation solutions it is the right way to obtain software development services. A lot of thanks for your fresh tips. Casino affiliates always look for casino affiliate program to increase their revenue income from best casinos or poker rooms. Thanks for sharing this take on social media looked at through these eyes. One of the most difficult things is to convince new authors they need to follow the yellow brick road to promotion.